If you happened to be one of my big brothers stuck with ensuring I didn’t get into the sharp cutlery while our parents escaped for a little while, then three songs could always distract me. Two were by the Beatles: Yellow Submarine and Maxwell’s Silver Hammer. The third was Down on the Corner. The Beatles were a cultural powerhouse at the time and their images were remarkably polished by that point. Even their names seemed to conjure different moods- each associated with specific music. I knew that if Ringo sang it, then it was for me. So, how did Creedence enter the picture? I spent my pre-adolescence trying to figure out who they were. Their greatest hits released when I was twelve. I was shocked by how much I loved every single song on that double album, but it seemed like I couldn’t talk to anybody about it. Sure, the radio played their tunes, but something about that dirty swampy boogie… Those were the days of progressive rock and disco. Country rock was big, but the Byrds received the credit and the Eagles carried that torch. And I was a little slow on the uptake. Remember that bit up above about the Beatles being distinct personalities? It took a lot longer than it should have for me to put together John Fogerty and Creedence Clearwater Revival. I was a kid. I spent some of those years sequestered away in boarding school from whence we all emerged somewhat behind the times. I had a limited set of music available. Either the radio played you or you were on the handful of cassettes I could keep in my dorm room. CCR was not available. Little did I know about all the legal wrangling that ensued after the band dissolved in 1972. 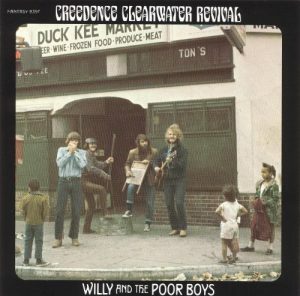 Fogerty released solo albums and maybe I noticed some similarities to CCR, but I no longer remember. Then, they released me back into the wild and I rediscovered CCR almost immediately. And I still felt weirdly isolated in my appreciation. I’ve got them playing in the background now and every damn song is wonderful. But I still don’t know where to turn. A few years ago, a local reporter covered a local John Fogerty concert and wrote about the thrill of listening in the wings. It felt like he was talking about someone else. So, what’s wrong with me? For crying out loud, everybody loves Lookin’ Out My Back Door. But that’s just it- CCR somehow connected with that essential thing which creates our shared human condition. Their music seems like it was always here, more permanent than national anthems or number one hits. Every now and then, a new work of art comes along that seems as old as time. Any artist that can connect even once with our common soul needs our attention. James Brown did it. CCR did it. I’d like to think that everyone I mention in this series has done it. You’ve Got to Check This Out is a blog series about music, words, and all sorts of artistic matters. It started with an explanation. 203 more to go.